It has been a long time since I posted but my life has been busy with my healing foot fracture (which occured in February 2009)and preparing for my son's wedding in April. I am truly blessed with loving children, family and friends. 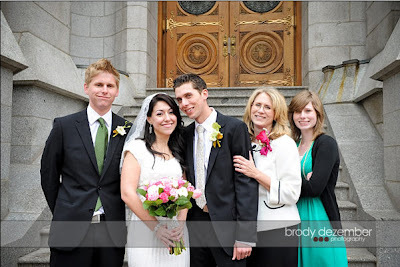 My son Kevin was married to Vanessa with all having an enjoyable time and feeling loved. Vanessa is a wonderful addition and fits right in with our family. 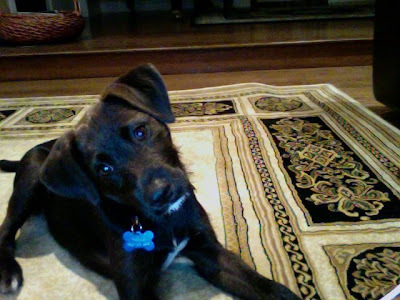 I rescued a little lab/terrier mix puppy which became Maeby (named after the Maeby character in "Arrested Development") while I was out injured with my fractured foot. She has been fun, but I forgot what is was like to have a baby. I know have a baby gate up and am constantly having to clean the house because of all the wonderful treasures that Maeby finds outdoors to chew on and to share. It has been a busy few months but most fulfilling and fun. Two and a half weeks ago I was walking my dog, Maeby. As we came around a corner, I noticed a gentleman who had two white dogs on expandable leashes, was visiting with some friends. As we got closer to this gentleman, his dogs started to move about. Then without warning this little white dog charged at Maeby and she became scared. Trying to get away from the dog, Maeby darted in front of me and I tripped over her landing on my left hip. I had instant pain in my hip, rolled to my back and was unable to stand or straighten my left leg. Maeby sensing that something was wrong, came to me and began licking my face. A crowd gathered; many people trying to help me and even started to straighten out my leg but stopped when I told them not too. I eventually ended up going to the ER and as I had suspected, was diagnosed with a hip fracture. I have since had to have surgery and am currently in a rehabbing at home learning how to walk and bear weight on my injured leg. This has been a major learning experience for me and I hope that I learn the lessons well so that I don't have to revisit the issues I have faced. I have been blessed by wonderful children, family and friends who have helped me face this challenge. My children, Kristopher, Kailee, Kevin and Vanessa have been so helpful calling and visiting me and maintaining the home front. Lyn and Wayne have been instrumental in helping throughout the process of securing a surgeon, visiting with me throughout the hospitalization, and helping me cope with the loss of mobility and the associated frustrations I have felt. Jokingly, I say, that my great great great grandmother must have been cursed by a Gypsy sometime ago and I am bearing the brunt of the curse. :-) But as my Mother always said, "This too Shall Pass." Sorry to hear of your accident. I hope you are mending well. Renee, thank you for the well wishes. I am improving daily but it has been a very humbling experience; I have learned a great deal about myself, others, and the entire process of hip fractures, i.e. the healing process, how it feels, etc. This is the second time in my life I have fractured something; the first one (fracture of my foot) in February of this month and then this fracture of my hip. I have been truly blessed by wonderful children, family, and friends. I am hope to catch up on some of my blogging while I am away from work.